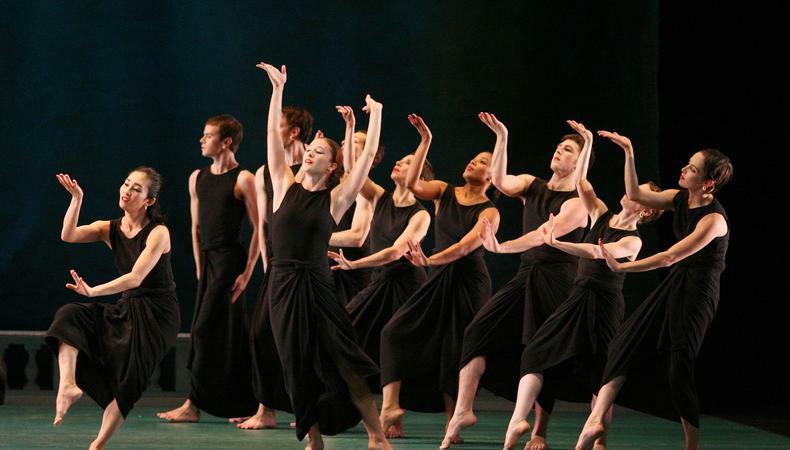 Though the enthralling “Dido and Aeneas” features the Mark Morris Dance Group in ingenious choreography by Morris, the music, most especially the singing of Stephanie Blythe, is the star of the show. Choreographed in 1989 to the splendid Henry Purcell opera of the same title, “Dido and Aeneas” places the score at the forefront of the aesthetic experience. While 18 dancers occupy the stage, and the instrumentalists, choir, and vocal soloists are relegated to the orchestra pit, most of the time the faces of the solo singers are brightly spotlighted, while the dancers perform under muted illumination (designed by James F. Ingalls). The engulfing voice of mezzo-soprano Blythe is so magnificent that whenever she sings, despite a stage full of dancers, one’s focus shifts downward, searching for the source of the powerful sounds. Blythe sings the roles of Dido and the Sorceress and is brightly supported by sopranos Yulia Van Doren and Clarissa Lyons, also in dual roles, as Dido’s friends and the Sorceress’ witches. (In the opera, the gods and goddesses who manipulate the lovers Dido and Aeneas in the Greek myth are replaced by witches.) The gorgeous baritone of Joshua Jeremiah (as Aeneas), Stephen Sands’ crystalline tenor (in a small solo role), and the airy singing of the Trinity Choir round out the show’s delightful rainbow of musical colors. In addition to the superlative musicians, what calls so much attention to the goings-on in the orchestra pit during this dance production is the presence of Morris on the conductor’s podium. How often does a world-class choreographer pick up the baton and conduct the musical piece to which his company is performing, particularly when it’s an opera? Intrigued with Morris’ ability to do this, one finds it tempting to divert attention from the stage and steal glimpses of him “at work” with the musicians. With Christine Van Loon’s plain black costumes that barely distinguish one character from another, save for Dido’s alarming metallic fingernails, and a grubby turquoise-and-brown backdrop that looks like an abstract map of the Aegean Sea hung by third-graders, the show blatantly de-emphasizes visual spectacle. It is all about sound and body movement. Using a lively vocabulary of quirky contemporary actions—seasoned with two-dimensional shapings that recall ancient Greek pottery designs—and an abundance of detailed hand movements, Morris has concocted a brilliant choreographic hybrid, integrating a dramatic and musical approach simultaneously. It is the rare choreographer who can use dance to effectively tell a story while also creating pure-movement pieces that express the qualities of a musical score. In this work Morris amazingly does both, in the same piece and at the same time. While employing a diverse palette of kinetic energies and spatial patterns to capture the rhythms, textures, and melodies of the score, he constructs those choreographic statements out of movements that signify the narrative. While an opera’s drama is fully present in its music, Morris has created a transparent choreographic container that exposes exactly how that happens. Presented by Lincoln Center as part of Mostly Mozart at the Rose Theater, 33 W. 60th St., 5th floor, NYC. Aug. 22–25. Wed.–Fri., 8 p.m.; Sat., 5 p.m. (212) 721-6500 or www.lincolncenter.org.